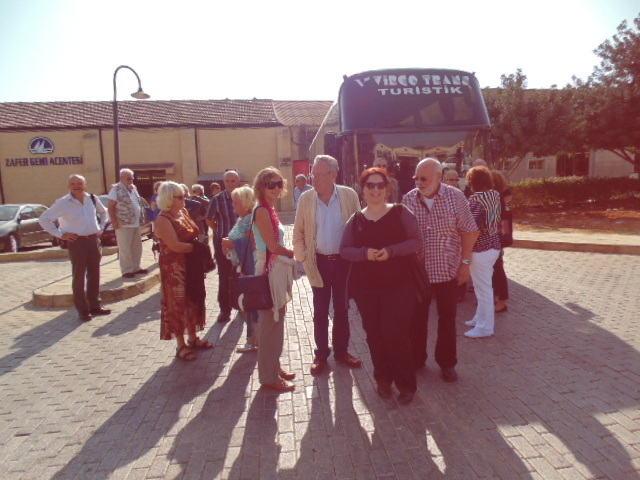 On Wednesday, 13th November 2013, 32 members and guests from 6 different countries of origin joined the TFR to be part of a day trip to the old walled city of Famagusta. Early in the morning the bus of Virgo Trans waited in Lapta ready to pick up the first participants of the journey. As we travelled through Kyrenia more and more passengers got on board, finally we went towards Famagusta, and arrived about 10am. 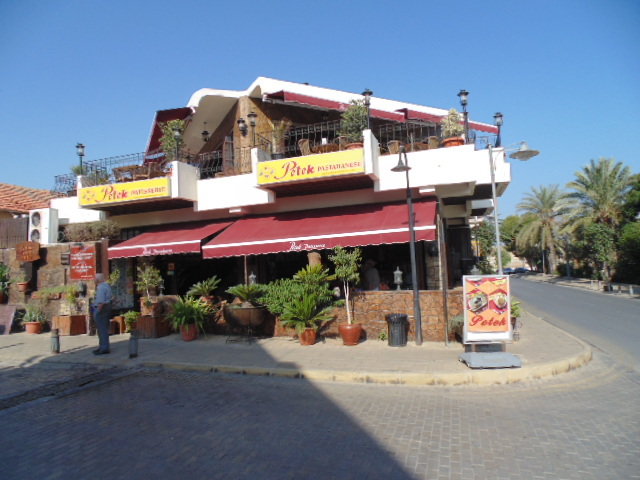 As I did not have breakfast before, my stomach was growling, but fortunately the first place we went to was the famous “Petek Patisserie and Café” in the old town of Famagusta, where there was delicious coffee and pastries. Thus, the first hunger was saturated and the group was ready to go on their exploring tour. Brian Self, former Chairman of the TFR and Horst Gutowski, our Treasurer had organized the tour, but now a young lady joined the group, Ceren. She is an architect and was sent by the Department of Antiquities of the city to be our tour guide for the day. To say it from the start, she should do her job very well! A wonderful video about the old walled city of Famagusta with all its attractions you will find by clicking a link at the end ot the article. Therefore, I am giving only a very brief description of each of the buildings that we visited for the next 2 hours or more. 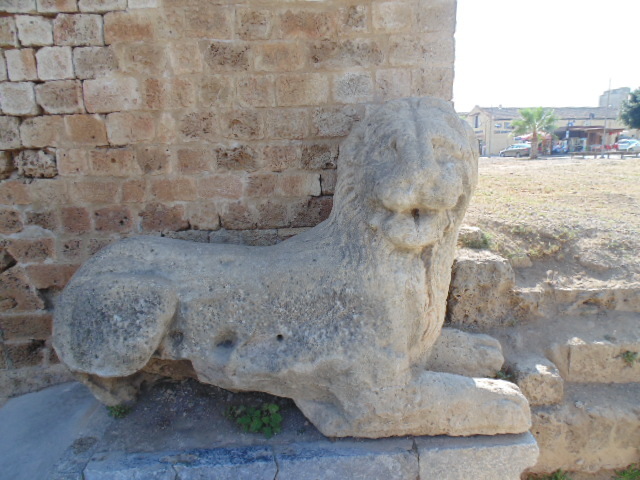 Ceren started with the Sea Gate, where the statue of the winged Lion of St. Mark is still reminiscent of the temporary rule of the Venetians over the island. The impressive domed building of the gate, which probably served as a warehouse and a lounge for the troops was built in 1496. The Othello Tower was supposed to be our next destination, but it is currently closed for renovations. So we went to the nearby Church of St. George of the Latins, an early Gothic building. Nowadays only to be seen as a ruin, but it still reflects the architecture of this era. Passing the Kertikli Hamam, the remains of a Turkish bath, we reached after a short walk the ruins of the medieval Carmelite Church and the neighbouring Armenian Orthodox Church, other witnesses of the legendary variety and number of Famagusta churches in earlier times (it is said the city had 365 of them, one for every day of the year…). 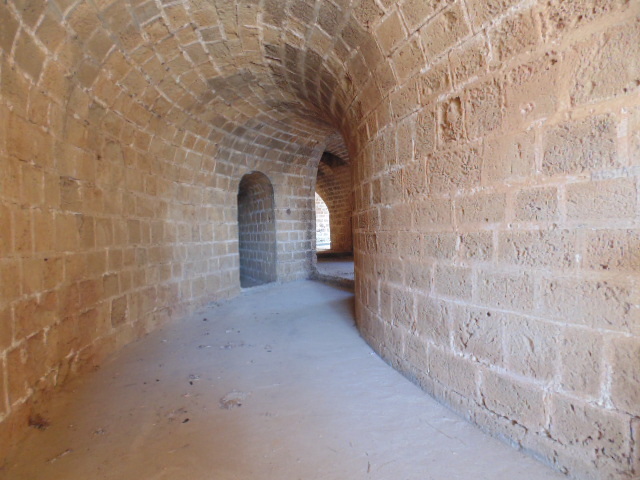 The subsequent visit to the Martinengo Bastion particularly impressed me personally. The great bastion is one of 13 towers in the massive ramparts of the old city, which are all still more or less intact. The enormity of this defence system instills me again and again and gives me respect for the skills of the architects and builders in those former days . Here I also learned why the countless bricks that were used to build the bastions and walls bear engraved individual characters. The different stonemasons who had delivered the material, could so make the bill with their clients after ending the work. Passing the Nestorian Church and the Kizil Hamam (Scarlet Bath) we went to the Land Gate, also known as the Rivettina Bastion. Climbing up the gate you enjoy one of the best views over the city walls and the entire old city of Famagusta. The early Gothic church St. Peter and St. Paul’s from the 14th Century with its beautifully articulated facade, located in the historical centre of the city, was converted by the Turks after 1571 to Sinan Pasa Mosque. It is said that the erection of the church was originally sponsored by a Venetian merchant from the winning of a single trading journey. 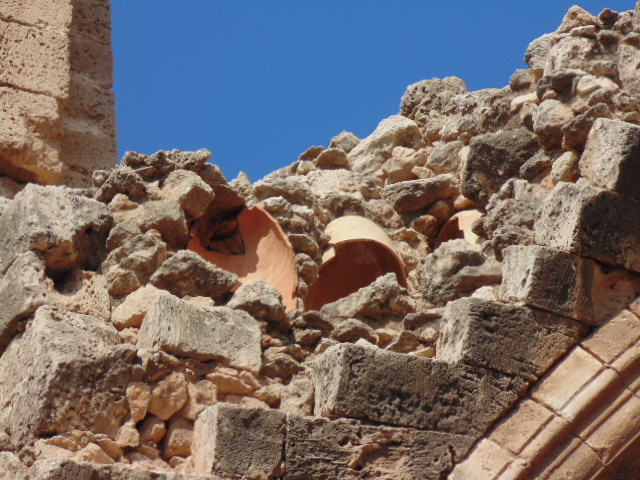 At the Greek Orthodox Church of St. George from the 15th Century can still be seen the medieval construction technology, such as over the vaults amphorae were used as a filler to reduce the burden and to improve the acoustics. Of course at the end of our tour it was obligatory to visit the St. Nicholas Cathedral, built 1298 – 1326 in pure Gothic style. Also in 1571 the church was converted into a mosque by the Turks and named after the leader of the conqueror army, namely Lala Mustafa Pasa. In front of the mosque still stands the legendary Sycamore tree which is claimed to be as old as the church itself! Now I had seen enough and was very thirsty and hungry, as were most of the other participants as well. So we said goodbye to our charming city guide Ceren, boarded the bus and headed towards the last destination of our day trip, which was a restaurant at the fishing harbour of Bogaz . 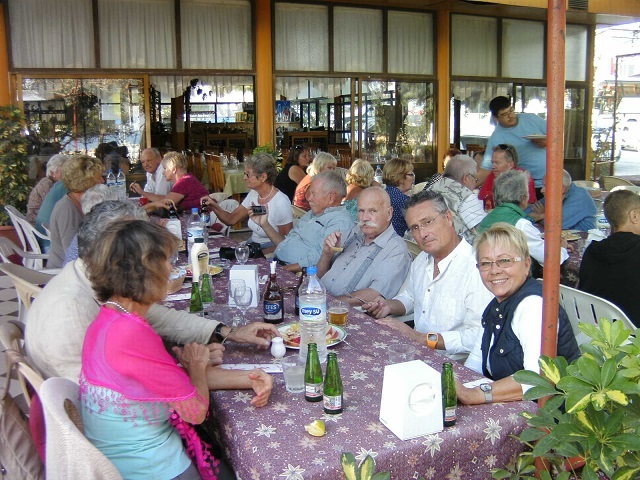 After the late lunch and lively conversation at the tables we went back to Girne . A completely successful and interesting trip!